Macedonia is Greece's largest region, and its capital, Thessaloniki, is the country's second-largest city, also dubbed ''the capital of the north''. This northern part of the country has a history and culture going back to some 4000 years. This is where Alexander the Great reigned and organised his army to conquer the Middle East, Egypt and Asia as far as India. The area is rich in archaeological sites, such as the Royal Tombs in Vergina, built by King Philippos II, ancient Pella and Dion and the sanctuary devoted to the worship of Zeus. Macedonia is also the site of the Monastic community of Mt Athos. With thickly forested mountains and tumbling rivers, the entire region of Northern Greece offers great opportunities for trekking. Most towns here have considerable appeal with atmospheric old quarters of narrow streets and wood-framed houses. Must-visit attractions include the ancient town of Pella, most famous as the birthplace of Alexander the Great, and the ancient site of Vergina. 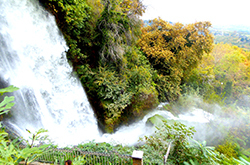 The town of Edessa, extolled for its many waterfalls, is a truly delightful town. Little streams and bridges and cool and shady parks dot the entire town, which is easy and pleasant to explore on foot. Another area of outstanding natural beauty is the mountainous north-west corner of Greece where the two lakes of Megali Prespa and Mikri Prespa are located, at an altitude of 850m. The two lakes are separated by a narrow strip of land. 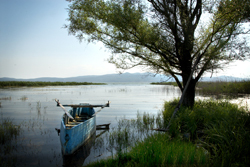 Mikri Prespa is a wildlife refuge of considerable interest to ornithologists. Surrounded by the thick reed beds, the area is the habitat of numerous species of birds, including cormorants, pelicans, egrets, herons and ibis. The area of the lakes has been declared a national park since 1977. The village of Psarades, on Megali Prespa lake, is a revelation. It lies within a small inlet of the lake and is Greece's last village before the borders with Albania and the FYROM. Psarades is a delectable little village whose traditional stone houses are subject to a National Trust preservation order, and its old fishing boats are made of cedar and oak.